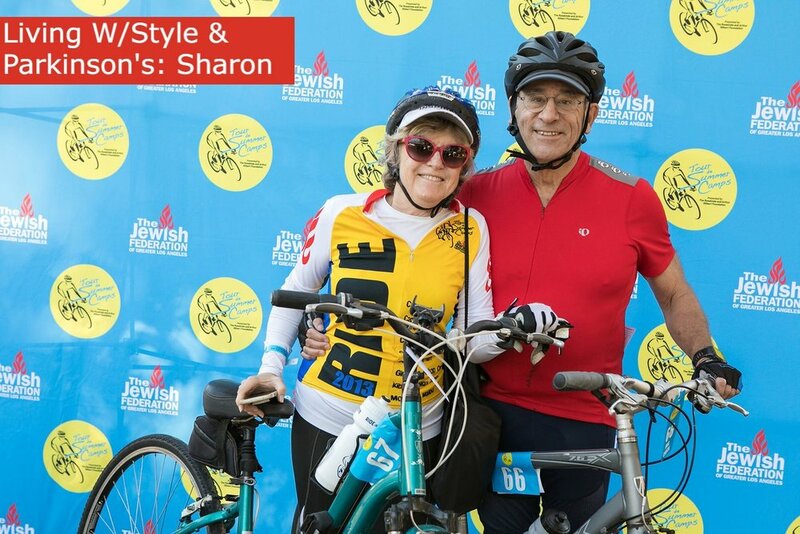 Sharon Krischer has an incredibly full life. She has a wonderful blog called Twitchy Woman, which gave me the inspiration to start my own blog and is a motivating advocate for Parkinson’s. So I was thrilled that she agreed to do my first interview in a new column called Living w/Style & Parkinson’s. Sharon tell me a little about yourself. I grew up in St. Louis, met my husband, Joel, at the University of Illinois and followed him to University of Michigan where he went to law school. I live in Beverly Hills, California with Joel, otherwise known as Mr. Twitchy, and our dog Lucy. We have 3 daughters and 4 grandchildren. I have a master’s degree in Audiology and had my own Calligraphy and stationery business for about 15 years. I then got involved with non-profit organizations, serving as president in several of them and found my niche training others to become leaders. We love to travel and have been all over the world in the last 10 years. I started noticing some odd things in the spring of 2008. I would be writing and my foot would start to shake, and it intensified after breaking my other ankle in August. In January 2009, my Internist sent me to a Neurologist who said I had a Parkinson’s like tremor. He put me on Requip and sent me home with no information about PD. I was also diagnosed with breast cancer that same month and had a lumpectomy and 6 weeks of radiation. It was not a good month for me. When I came out of my fog from everything about 6 months later, I went back to my internist, insisting that I needed to change doctors. He then sent me to a Movement Disorders Specialist, who diagnosed my PD, changed my medications and gave me a lot of information. I have been with her ever since. I have been fortunate that I have tremor dominant Parkinson’s, which progresses much slower than other types. 10 years later, I am still doing well. I began to get involved with the PD community about 5 years ago when I started getting phone calls and emails from people asking if I would talk to their relative, friend, co-worker who was recently diagnosed. Those meetings led me to start my blog, Twitchy Woman, in March 2015 to reach out to a broader audience. I never imagined that I would still be writing the blog almost 4 years later. And the blog has created many opportunities for me, including being an official blogger for the upcoming 2019 World Parkinson Congress in Kyoto. I love reading your blog and in it I can see how active you are in the PD community. What would you say those who are thinking about being more involved and what is a good way to start? Start in your community – go to a support group, join a PD exercise, boxing, yoga or dance class to meet others with PD. Attend local programs put on by a local or National PD organization. Find out how you can get involved in one of the organizations at the local level. The Parkinson’s Foundation, Michael J Fox Foundation, APDA (American Parkinson’s Disease Association) Brian Grant Foundation and Davis Phinney Foundation are all National Organizations that are good to reach out to. My grandchildren! Actually, all things considered, things are pretty good for me, and having Parkinson’s has opened up a whole new world of opportunities. I have met many new friends with PD, we laugh together and cry together, we understand each other. My tremor in my foot is acting up again, creating some problems for me. I did not start to take Sinemet until 5 years ago and have never increased the dose. I am worried that my symptoms are starting to get worse. My other challenge is to slow down. I often take on much more than I should because I forget my limitations. I take my dog on an early morning walk, which at this time of year, is before the sun comes up. It is so quiet and peaceful. A good way to start the day. I use mostly Laura Mercier products. However, my dermatologist has a cleanser that she developed, which has really helped relieve my dry skin. And for my itchy scalp, a beauty supply recommended Klorane Sos Serum with Peony for Sensitive and Irritated Scalp, which works better than anything else for me. It seems that everything I do is for self-care: yoga, boxing, tennis. Exercise 5-6 days a week. Massage every two weeks. Piano lessons, which are supposed to help my brain. Playing tennis with friends every week, leading an active life. My husband and my grandchildren! I am inspired by all of those people with PD who work hard to live the best life possible with a chronic disease. Don’t miss Sharon on her blog at Twitchy Woman and her Facebook page @twitchywoman. Sharon will also be blogging for the World Parkinson’s Congress this June from Kyoto, Japan.